This little Black-backed Jackal was extremely relaxed. He was lying in the middle of the road when we approached, then stood up for a moment, but decided at the end that we were not a threat. He even closed his eyes and had a nap. The Thanda guests enjoyed this little predator for quite a while, before we passed him slowly. He did not move at all! Most of the time wild creatures are very careful and weary. This little one had his “trusting” day. The Black-backed Jackal (Canis mesomelas) is a species of Jackal which inhabits two areas of the African continent including the southernmost tip of the continent. 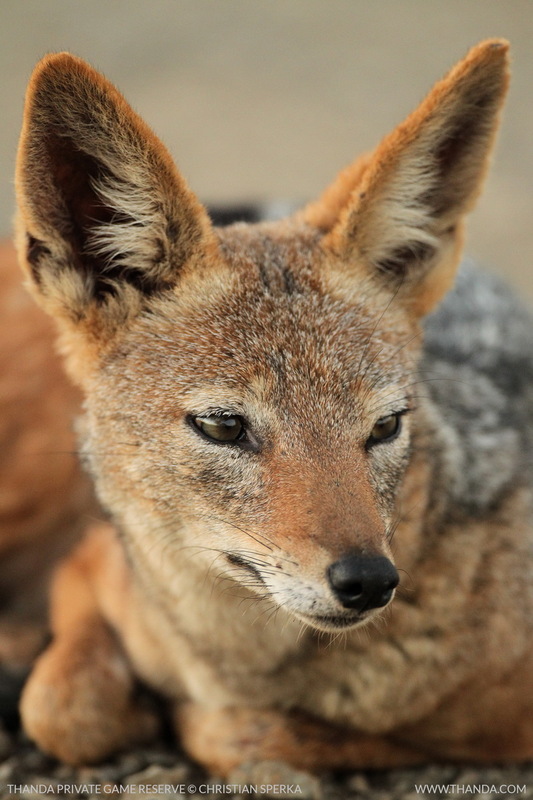 Although the most lightly built of jackals, it is the most aggressive, having been observed to singly kill animals many times its own size, and its intra-pack relationships are quite quarrelsome. Beautiful as if he knows the only shots he will encounter are those from a camera.